The Postmaster General (Mr Broadfoot) extends a cordial invitation to the general public to take part in the opening ceremony of the new Himatangi Radio Station, to be held at 2pm on Monday, 9th November, 1953, and later to view the equipment and buildings. 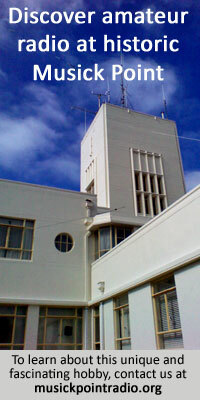 The ceremony will be held at the main transmitter building at the end of the main driveway in the station grounds. With the official ceremony yesterday Radio Himatangi now provides a modern link for radio-telephone and radio-telegraph communications with overseas. This marks an important step in the progress of New Zealand, for, on the transmission of messages quickly and efficiently, depends much of the economy of the country. Previously, all radio-telephone conversations with England and the USA were routed via Australia. Situated 19 miles such [sic] of Palmerston North in a barren section of country near the coast, the £300,000 project occupies more than 800 acres of land covered for the most part with a sprawling system of aerials. There is also a huge transmitting and powerhouse and administration block, two rows of staff houses and a long singlemen’s quarters and recreation rooms. The ceremony of declaring the station open was carried out by the Postmaster-General, Hon WJ Broadfoot, and a crowd in the vicinity of 1000 were present to witness the event. The attendance was beyond expectations and a great many had to stand among the transmitting equipment during the ceremony. All speakers paid tribute to the staff of the Post and Telegraph Department who had worked on the project. The Director-General, Mr PN Cryer, presided and remarked at the outset that it was a memorable occasion in the history of the New Zealand Post Office. He remarked that he hoped the little group of workers located on the site would make some contribution to the community of the surrounding district. “Today brings to fruition what has been a dream for many years. That it is so today is due to the work of a great many people – and among them we must not forget the pioneers in the field of radio. I would like to take the opportunity – and it is one which does not occur very often – of paying a tribute to those men behind the scenes in our communications system, the P and T radio staff,” added Mr Cryer. “I am intrigued that when one speaks to the United Kingdom via radio-telephone it is possible for one side of the conversation to travel over the Arctic, the over over the Antarctic. Sir Matthew Oram, Speaker of the House of Representatives, and MP for Manawatu electorate, remarked that the project was just one more achievement by the P and T along the road of giving service to the public. Tracing the history of communications with New Zealand, Sir Matthew said that a great advance had been made since Cook Strait has been crossed by cable in 1866 and the link with Australia completed in 1876.